Clare Coombe, Claudian the Poet, Cambridge, 2018. 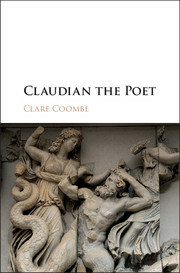 This comprehensive reassessment of the carmina maiora of the fourth-century poet Claudian contributes to the growing trend to recognize that Late Antique poets should be approached as just that: poets. Its methodology is developed from that of Michael Roberts' seminal The Jeweled Style. It analyzes Claudian's poetics and use of story telling to argue that the creation of a story world in which Stilicho, his patron, becomes an epic hero, and the barbarians are giants threatening both the borders of Rome and the order of the very universe is designed to convince his audience of a world-view in which it is only the Roman general who stands between them and cosmic chaos. The book also argues that Claudian uses the same techniques to promote the message that Honorius, young hero though he may seem, is not yet fit to rule, and that Stilicho's rightful position remains as his regent.